MV Gathering & Awards - This Friday!! 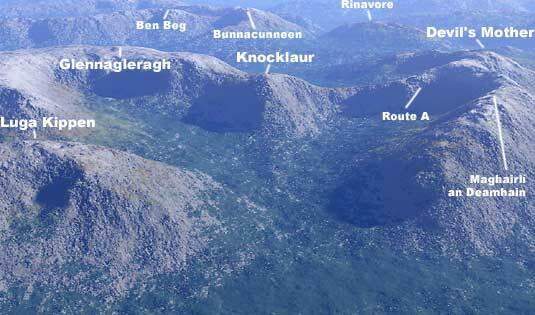 Knocklaur is an impressive spur pushing north into the Glennacally valley, or at least it is from the valley floor. Reaching it from ridge on the Maumtrasna side it's just a pull up of 40 or 50m. Mindful of Wicklore’s cautions of an ascent from the north and Simon3’s almost interdiction of a descent in this direction, I approached the northern spur of Knocklaur prepared if neccessary to walk around it’s base in order to find an ascent route, a line of attack so to speak. I parked at L935 656 E, Glennacally Bridge. This is some 8km NW of Leenaun on the N59. Going through the gate directly south of the parking area, I followed the east bank of the Glennacally river. The first sections encountered here cut right through the rock forming some dramatic channels, not what you’d expect from the map. After about 1km, the river is joined by a branch from the left, the Glenfree. This was shallow when I was there and it was easy to cross. Knocklaur’s northern spur loomed large straight ahead as I continued heading south, following fairly close to the left bank of the river. After another 1km, I crossed the river just after a ridge on the opposite bank, a section of moraine perhaps? 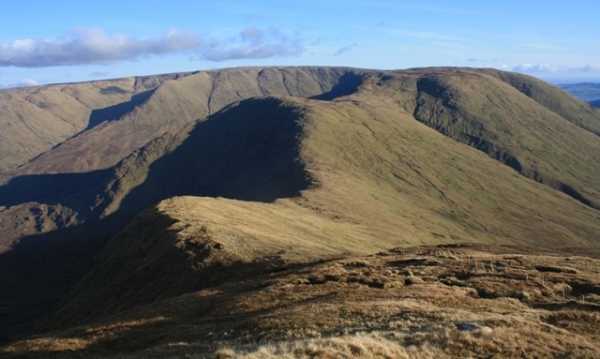 I could see an obvious green ramp heading diagonally up the incline from the left (east) side of Knocklaur’s northern spur and up to it’s central spine. The ramp starts around L93838 63581 F and ends on the spine at L93486 63545 G. This ramp is steep but is very do-able. About halfway up the ramp I veered left, weaving through some rocky sections and going more directly up the slope, hands required. When I reached the spine, interested to see whether I should have stayed on my original course, I descended down towards the point where the ramp would have arrived. I didn’t go all the way down, but I don’t think there was any obstacle further down, so staying on the ramp would probably be an easier route up. 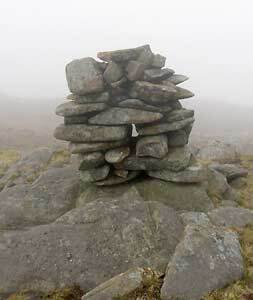 Once on the spine, it’s just a matter of some fairly easy scrambling up to Knocklaur summit. The clouds hovered around the 500m mark, so while I could see down to the cols - the western one towards Devilsmother being a particularily steep descent - Devilsmother itself, the next peak on the route, remained hidden. Knocklaur can be approached from the North at Glennacally bridge (L93519 65641 H) where there is some parking on waste ground adjacent to a bungalow surrounded by trees. Permission can be sought at the bungalow and will probably be given readily. 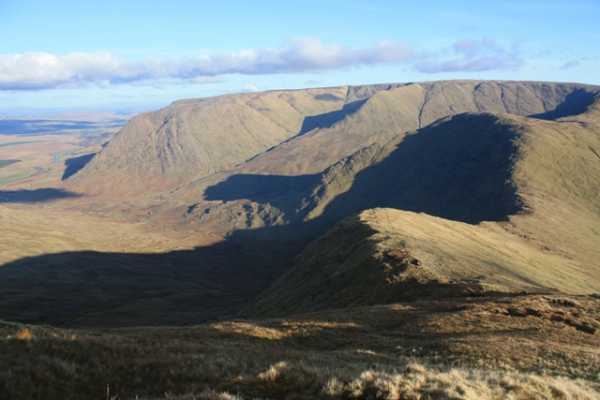 Knocklaur can be the first hill on a circuit to also include Devilsmother and its North top. 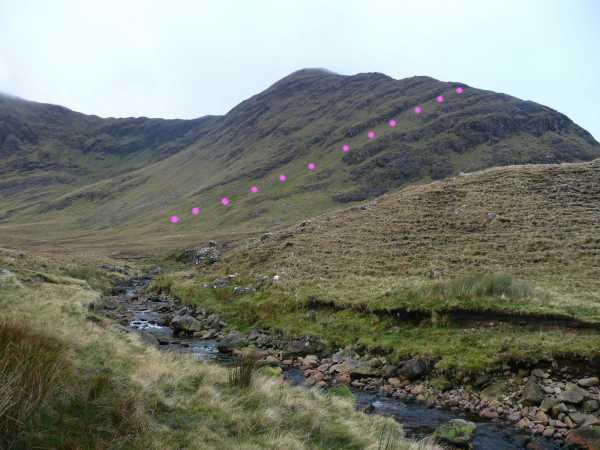 The route south to Knocklaur crosses two streams, the Glenncally and the Glenfree, both of which can become seriously difficult to cross after rain. I would recommend crossing these at the earliest possible opportunity or you may be condemned to wander upstream of both and away to the east of your route. In fact, if doing this route again, I would cross to the west of the Glenncally river at the bridge which would outflank the Glenfree. Fingalscave notes a ramp beginning around L93838 63581 F and ending on the spine at L93486 63545 G. This is likely to be the best approach from north or east. Due to detours made in order to get across the river, I missed this ramp and wound up well south of the approach to the ramp - instead I looked straight up at a wall of a hill which looked staggeringly steep. I did get up but at times it felt almost vertical and I had to climb grabbing handholds of mud. Any major slip and I felt would have slid down a vertical 150m before stopping. I would strongly recommend that, if approaching Knocklaur from this direction, that you find and use the ramp rather than any other ascent.